I posted this over at www.minisculpture.co.uk and thought I'd post it here too as a bit of an update. 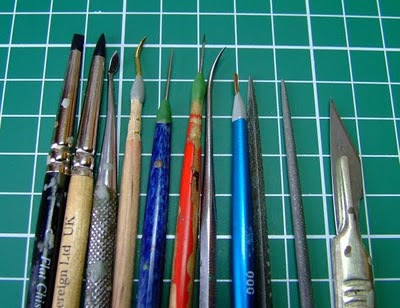 These are my most commonly used tools, some bought and some home made (never throw away old paint brushes). A Royal Sovereign clay shaper, Flat chisel size 0 extra firm. Could do nothing without this little tool. After the putty is on and roughly shaped, I'll use this for smoothing, shaping, more smoothing, more shaping. Indispensible for me. Another RS colour shaper, this one was bought from heresy miniatures. Often use this for eye sockets, not used so much but very useful when the situation is right. Still on the look out for a very sharply pointed clay shaper so if anyone knows where to pick one up let me know! My basic shaping tool, bought from heresy again (can't say I use the rest much...). I use it for rough shaping the putty when it goes on to the figure. Slightly rounded on the other surface so good for smoothing/ blending. I made this from a bit of brass wire (just using pliers, files and sand paper so not too tricky). Stuck in an old paint brush. Was aiming for a finer version of the tool described above and thats what I got . Very useful for sharpening up those details. A dental tool, bought off ebay. Not great quality, but useful for awkward angles of attack and for the likes of folds in robes. A fine loop of 0.6mm copper wire. Again useful occassionally for folds, eye sockets etc. Finally, files and a sharp scalpel, because to be honest I do a lot of scraping (which is why I used to sculpt in a GS/BS mix). Shapely long legs generally don't appear just like that so a fair bit of fine tuning is required! Don't be shy about this, it's all to get the final product after all. Anyways, I'm hoping some other sculptors on the forum will post pics of their tools so I can pick up some tips! They look very well used Andrew!